“Hey, would you build me one of those?” Steven DeMore heard those requests from coworkers when they saw the galvanized metal bin he fabricated to hold his tools as he worked in an aerial lift and thought “maybe someday” he would. The original idea for the design came about because the small space available on those moving platforms meant Steven’s tools had to be kept in a bucket on the floor causing him to bend over repeatedly – sometimes more than 100 times a day. After enduring a number of back related injuries and frequent trips to the chiropractor and doctor, this experienced sheet metal worker got creative. He put his design and construction skills to work and built a triangular, compartmentalized bin which he could attach to the corner frame of any lift. It relieved his back, made his work easier and safer, and would be the thing that later changed his life. 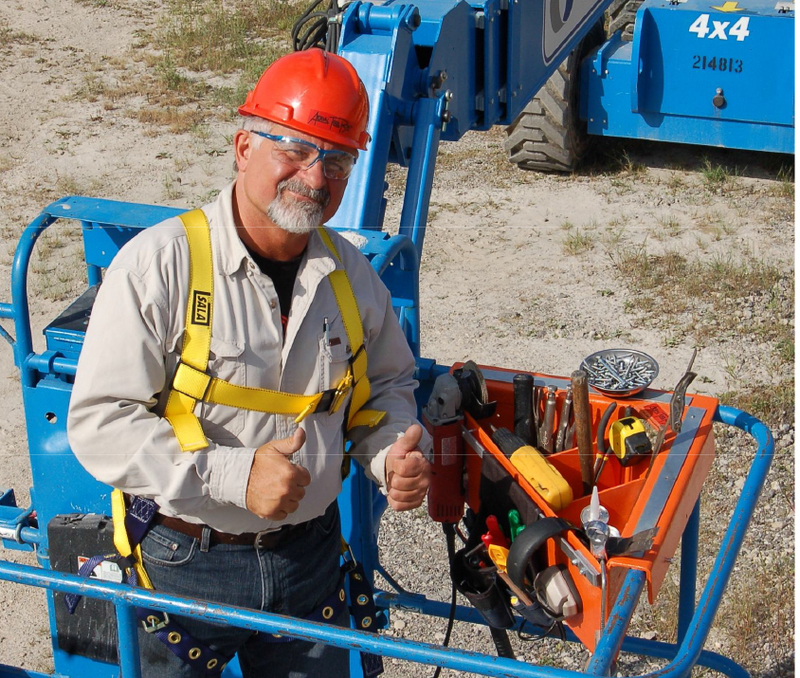 been revised, requiring aerial lift workers to wear safety harnesses, conflicting with the tool belt on their waist and restricting ability to bend. That prompted Steven to proceed with the development and manufacturing of his idea, now known as the Aerial Tool Bin™. The original galvanized prototype weighed an ungainly 20 pounds so Steven began to explore alternative materials, settling on injection molded, reinforced, high-density, Chunk saved non-conductive polyethylene plastic in bright “safety” orange, making the product lightweight and very durable. 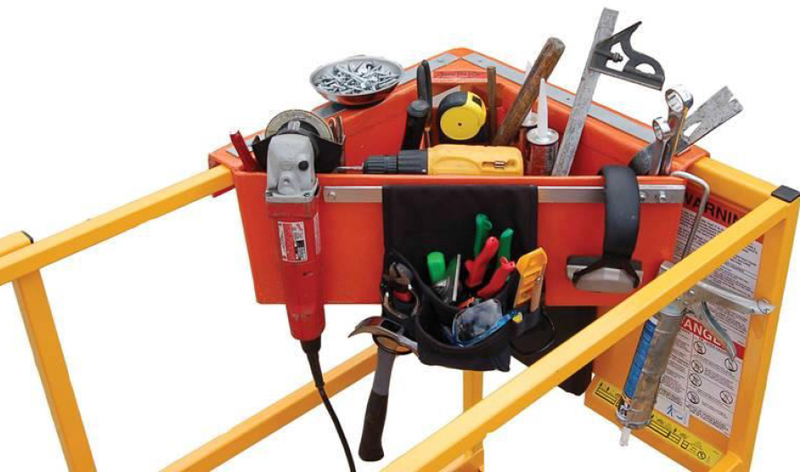 The Aerial Tool Bin™ is fabricated with an integrated handle, tool belt attachment and magnetized tray to corral small parts. The patent process began, as did the search for a manufacturer. Steven had researched and interviewed more than 12 domestic companies without success when one day as he worked in his home office, a file folder dropped to the floor and fell open, revealing the name of an Eagle, Wisconsin plastic manufacturer. Steven took that as a sign and got in touch. They quickly came to a production agreement and the relationship has been solid from the start. Steven’s company DeMore’s Innovative Design, Inc. was awarded a patent on the Aerial Tool Bin™. It wasn’t as easy as it sounds. The health issues and lack of work in the area took a financial toll on Steven, eventually causing him to liquidate assets and sell his home. It was at this time in 2010 that a friend introduced Steven to SCORE. Soon he was paired with volunteer mentor John Connelly who immediately helped Steven address the financial aspects of his business. “I’m a one-person company so I don’t have anyone to bounce ideas off of. It’s easy to get into a routine and without feedback, you don’t know if there is a better way. John has been great,” Steven reports. He worked with John to refine his business plan and attended several SCORE workshops to deepen his knowledge. Steven and John have an enduring relationship based on trust. As Steven explains, “It is priceless having a skilled professional who I can talk to confidentially about anything. When there was something John could not assess, he called in other SCORE mentors to assist. John would even check in to see how things were going while he was on vacation,” he adds. “When I started working with Steven as a SCORE client we addressed funding problems, design and manufacturing considerations, marketing .... virtually the full range of challenges facing a startup,” said John. “He has a nationwide distribution deal with W.W. Grainger, with others in the works, and has recently expanded into the international market.” A local company handles order fulfillment. Business has been good for the product that encourages workers to “take your tools to a new height.” Sales doubled in 2011, tripled in 2012 and doubled again in 2013. Steven is still a one-person shop, responsible for handling accounting, manufacturing issues, marketing and “putting out fires.” His business plan was never based on accelerated expansion so Steven is satisfied that this pace has offered him the chance to learn and develop his business skills along the way. He credits SCORE for helping him make the transition from construction worker to entrepreneur. The Aerial Tool Bin™ is not the first product Steven has designed and it won’t be his last. Over the years this energetic innovator has developed a number of furniture ideas that are both aesthetic and utilitarian and he already has another product in the prototype stage with others on the drawing board. It’s been seven years since Steven thought…maybe someday. And now, with the help of SCORE, Steven DeMore’s creative ideas are taking him to new heights.